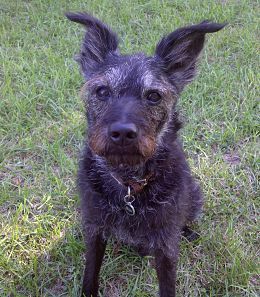 Think about intestinal parasites in dogs the same way you would think about an unwanted relative who has come to visit, and won't leave. They eat all your food, watch TV late into the night, sleep all day and leave dirty dishes and clothes all over your house. Here is the definition of a parasite. An organism that lives in or on another organism (the host) and benefits by deriving nutrients at the host's expense. Does this look like anyone you know? Probably not! That's good, because you don't want your dog to host this unwelcome guest. There are many types of parasites able to take up residence in your dog's body. Here is how they are commonly categorized, from smallest to largest. Some of these are technically not parasites, but are foreign invaders, never the less! Fleas, ticks, mosquitos and mites can also be considered parasites, although they don't live inside your dogs body. They will eat your dog's food ( blood ), leave their toxic waste products in his body, and take all his energy. Here are some signs that might indicate that your dog has a parasitic infection. These common symptoms are often hard to pin down, and can also be symptoms of other things. 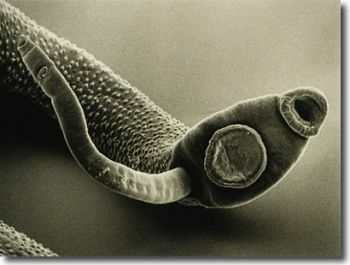 Once established in the body, parasites are hard to get rid of. Why would they want to leave that free meal ticket? Conventional medications used to treat intestinal parasites in dogs are powerful and toxic in themselves. Even some anti parasitic herbs can be hard on the body if you're not careful about how you use them. So, prevention is the best medicine. It's easier to prevent them, than it is to kill them. The best way to get rid of an unwanted guest, is to stop being a good host. In your dog's body this means increasing the level health and altering the biological terrain so that it is unfriendly to parasites. Brio says...no time to waste! This is where herbs and natural remedies can work better than chemical drugs for this purpose. True, they are not as strong as drugs for killing the parasites, but they are excellent for helping to alter the host environment to make it unfriendly and boosting immune function. This is why implementing a periodic parasite cleanse is very helpful for keeping your pet free from pests. There's no time to waste! Who needs uninvited, dirty guests!